5 Silver Stars! is the third mission of Bob-omb Battlefield in Super Mario 64 DS. 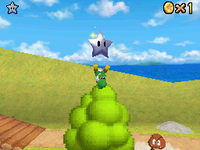 Its objective is to collect five Silver Stars located around the area. This mission replaces Shoot to the Island in the Sky from Super Mario 64. The general location of the Silver Stars are marked on the map. One is found at the top of a tree near the stage's entrance, one is held by a Goomba near a set of four pegs, one is being held by the Goomba wearing Mario's cap, one is in the middle of a patch of flowers near the base of the mountain, and one is attached to the end of the Chain Chomp's chain, who is roaming freely around the area. Spanish ¡Las 5 estrellas de Plata! The Five Silver Stars! Italian 5 Stelle Argento! Five Silver Stars! 5-gae ui silbeoseuta! Five Silver Stars! 5 kē Yínsè Xīngxīng! Five Silver Stars! This page was last edited on August 5, 2018, at 14:01.